I developed this brief tutorial to help people get up and running in Inklewriter fairly quickly. (If you’re not already familiar with it, Inklewriter is a web-based authoring tool that lets you create Choose Your Own text adventure games. It can be used for many purposes, especially prototyping simulations based on branching choices. Inklewriter is a web-based software that is used to create Interactive Fiction in the Choose Your Own Adventure (CYOA) format. 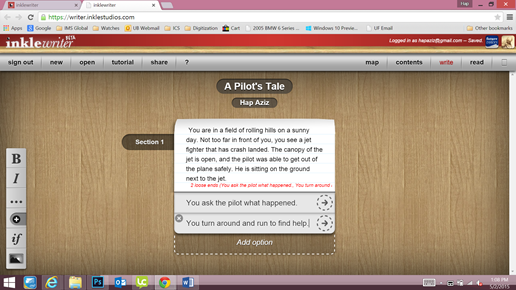 Interactive Fiction (IF) is a type of computer game that lets the player read a story and make choices that can change the direction and outcome of the story. Using Inklewriter for education purposes, abstracted (text-only) simulations may be created for a variety of learning assignments. Because IF games are mainly text-based, IF games were among the first kind ever written for computers. CYOA games are a type of IF that give the player specific choices at the end of each section These types of games are also a form of branching scenarios. The player chooses what he or she would like to do, and the branching scenario moves forward based on the player’s selections. Although no longer at the height of their original popularity, CYOA branching scenarios are still quite engaging, and they can be used on their own, or they may be developed as proof-of-concepts for more graphically-intensive simulation. There can be many different outcomes in an CYOA branching scenario, or the story can lead the player to a single ending. It is up to the creator to decide what the player is able to accomplish. To direct the player’s path through the scenario, the creator must develop a “map” of the story. The map is an outline of the story narrative along with the decisions a player is allowed to make and the places in the story that those decisions may be made. More instruction on this will be provided later in this document. 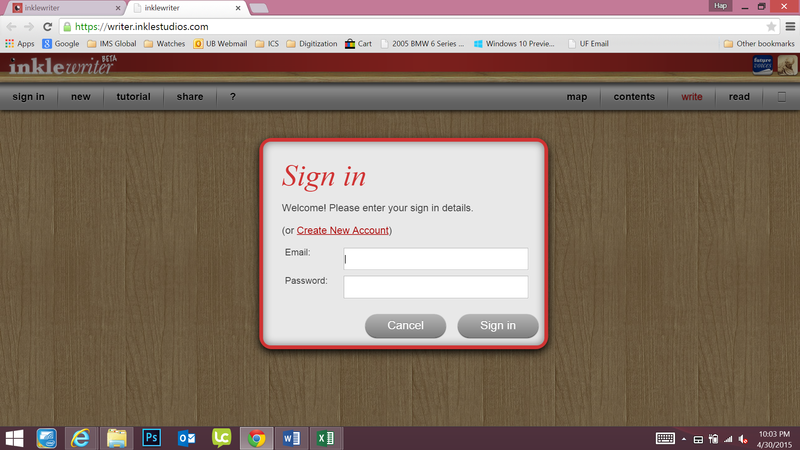 You will be able to create your own account by clicking the “sign in” button to get to the following screen. Here, you will click on the Create New Account link. 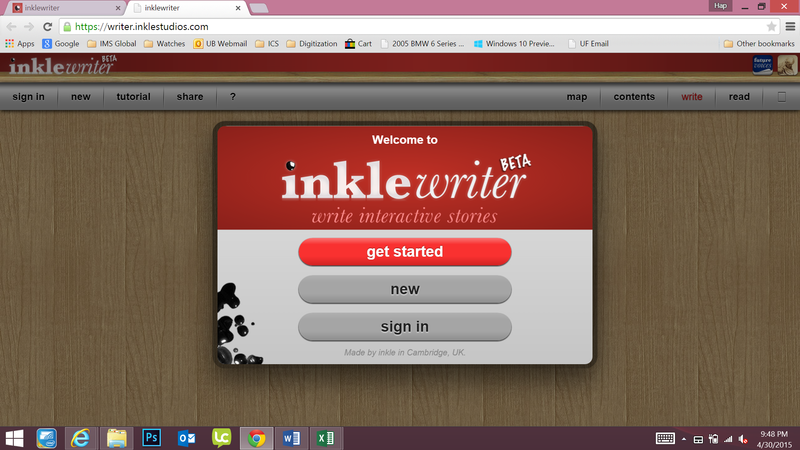 Once you sign into your Inklewriter account, you will see the screen below. This is your “blank sheet of paper” for creating your branching scenario. 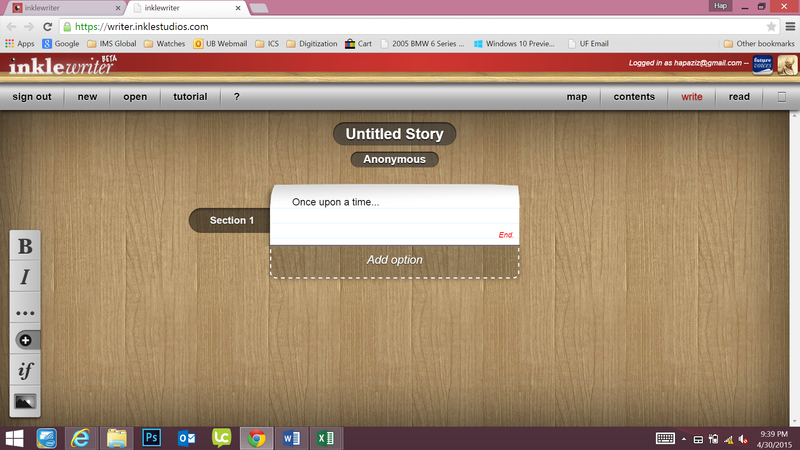 You will learn how to create a basic scenario using Inklewriter, but first we will talk about planning the scenario. It is very important to have an outline of how you want your scenario to “flow” and the choices you want the player to be able to make. There are no choices to be made, because the storyteller, author, or instructional designer has already decided what will happen and in what order everything takes place. In a CYOA branching scenario, however, certain places in the story allow the player to choose the direction. 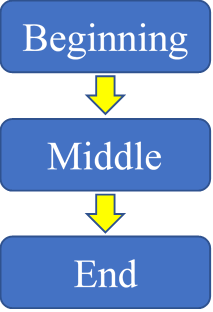 The above diagram is an example of a story that branches after the beginning into two different paths. The player may select one of two options, and the result be a different ending. 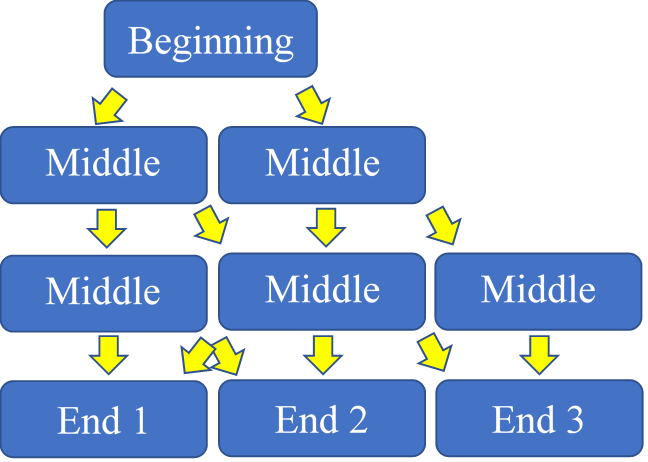 It is possible to have many options in the middle portion of your branching scenario, and this may result in more possible endings. Below is an example. 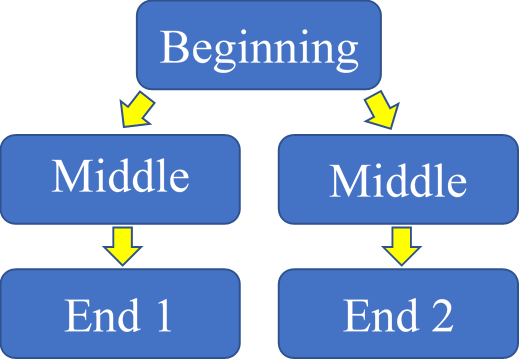 We see that after the beginning branches into two paths, those two paths branch into two more paths before getting to the four possible endings. You can imagine how big this map could become if you added several more levels that branch in between. 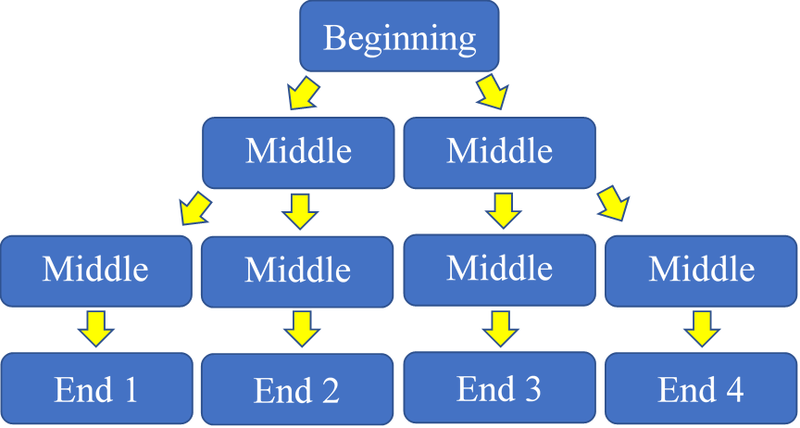 You can see in the above diagram that there are multiple paths that will take the player to the different endings. Although this is a more challenging scenario to create, it is often the most satisfying to play because of all the choices a player may make. Gather your materials, just as you would for a formal report or presentation. You will want to find good sources, especially those that might depict a narrative regarding the subject matter you expect to cover. Since your scenario will be in the form of a story, you may want to identify key figures with whom your scenario player might have “conversations,” such as an HR manager, professor, or characters from an historical event. You may want to think about a particular event or activity for your story, such as an employee review, a meeting between colleagues, or even a past war. You will want to decide the location in which the events of your game takes place. That location may be inside a building like a library, a government building, a city, or even a combination of places. You will want to identify objects that might have significance to the story you want to tell. For example, there may be a set of forms that contains information you want your game player to know, or there may be a policy manual to be reviewed. You should create a navigation map on paper first, outlining the story and the action choices where the story branches. Index cards might be a good tool for you to use. You are in a field of rolling hills on a sunny day. Not too far in front of you, you see a jet fighter that has crash landed. The canopy of the jet is open, and the pilot was able to get out of the plane safely. He is sitting on the ground next to the jet. You ask the pilot what happened. You turn around and run to find help. For each choice, you must decide what happens next. Let’s look at how to do this in Inlkewriter. To enter text that should be connected to the particular action, you click on the arrow button on the right side of that action. That will bring up another text box for you to enter the next section of your scenario. The pilot looks up at you and says, “We saw that Egyptian forces were being built up on our border along the Sinai Peninsula. Our air force was given the command on June 5th to launch a pre-emptive airstrike.” He pauses for a moment, and you notice that his lips are chapped. You offer the pilot your canteen. You ask what happened to the Egyptians. As you build out the different areas of your scenario, you may want to check the progress of your navigation by clicking on the “map” link at the top of screen. 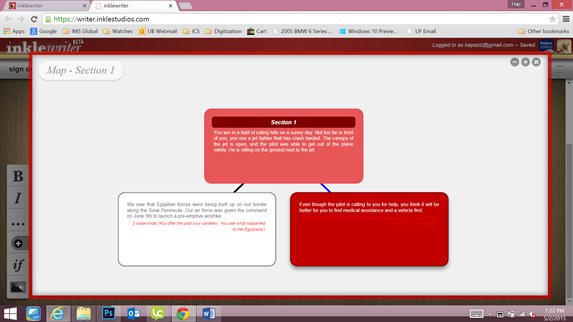 This will bring up a visual representation of the flow of your scenario such as the one below. The map that Inklewriter displays as you create your scenario should closely resemble the outline you first made when developing your scenario idea. 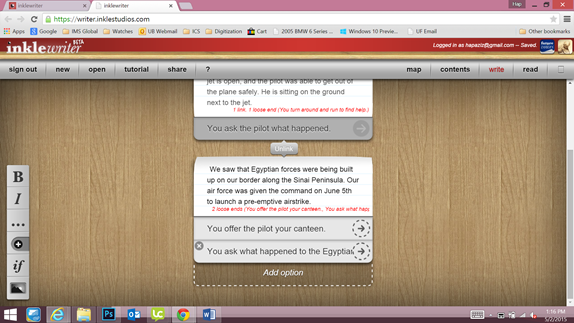 From here, you will continue to add branches and narrative blocks in the same manner. You may add as many branching choices as you like to each section, but more than three or four choices becomes difficult to manage. You will continue this process until all your branching paths lead to a conclusion in the scenario. 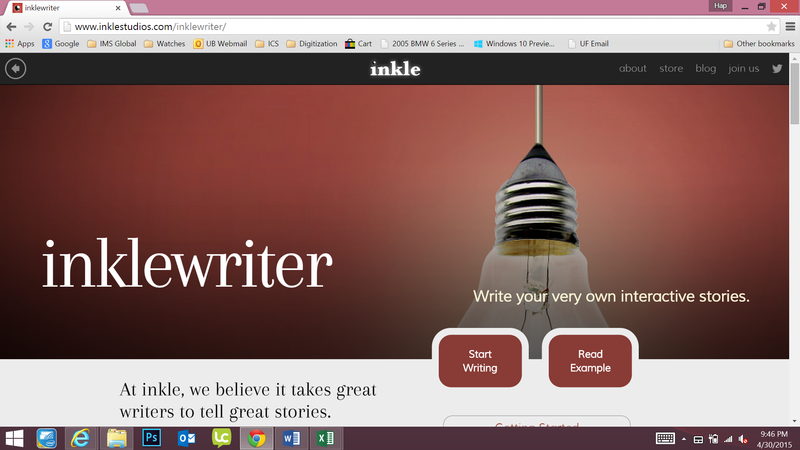 We have only touched upon some of the most basic functionality within Inklewriter so that your first experience using the system is straightforward. There are a number of resources for Inklewriter available, and within the Inklewriter authoring system there is a “tutorial” link in the top menu bar that provides a lot of helpful information. Back in October of 2011, I wrote an almost tweet-length blog entry on the transformation of education through an accident of technology (read it here). While I didn’t provide any details regarding that particular technology, if you have heard me speak on the topic, you know that I’m referring to the invention of the alphabet. My basic premise is this: human beings evolved to learn a particular way, which is through the use of all our senses in combination with lived experiences and traditions passed down from generation to generation, usually in one-to-one (or one-to-few) relationships. There were natural limitations to that education paradigm regarding the storage of information, the ability to pass on information without personal presence, and the facilitation of one-to-many teaching and learning relationships. The invention of the alphabet (first hieroglyphic and then later phonetic) essentially removed those limitations over time; however, at the expense of introducing an entirely new barrier to learning content: the requirement to learn how to code and decode symbolic information–the requirement to learn how to read and write before learning actual content. The invention of the alphabet changed the way in which humans learn, and our model of education reflects the necessary prerequisite of literacy before learning: the first years of schooling is focused on teaching our children how to code and decode the alphabet in order to unlock content stored and conveyed primarily through text. Ultimately, the way in which our civilization has set up the learning enterprise is not the way we humans are built to learn; yet here we are at a point in history where a convergence of modern technologies is dangling the promise of another possible transformation to education. The digital technologies that appeal to our dominant senses of sight and sound have become sophisticated enough to meaningfully engage and (apparently) facilitate learning without the need to code and decode the alphabet. Hand some iPads to a room full of three-year-olds and watch what they learn to do without having to read a word. This phenomenon hasn’t been lost on educators. There are studies on the use of video games to enhance the education experience (“Effect of Computer-Based Video Games on Children: An Experimental Study” and “Digital Game-Based Learning in high school Computer Science education: Impact on educational effectiveness and student motivation“); there are books and articles published on the subject (What Video Games Have to Teach Us About Learning and Literacy and “4 Innovative Ways to Teach with Video Games: Educators from around the Country Share Their Best Practices for Using Educational and Consumer Games to Improve Students’ Engagement and Performance“); organizations have been created and conferences are held to share the latest best practices and even how to secure grant and investment funding for new and innovative learning video games (Higher Education Video Game Alliance and GDC Education Summit); and there are even education games being produced by Nobel Laureates (Nobelprize.org). Intuitively this seems to make sense, and I’m not going to present or argue data here. At the very least there are the educators who feel it might be beneficial to have learners as engaged in course content as players are in their game content. Several questions come to mind when we consider the use of video games in education. How do we align gameplay with course learning objectives? What technology is required to play games, and how to we ensure access across the digital divide? What is the time commitment necessary to play the game to the point of content relevancy? Perhaps one of the most important questions to answer relates to the cost of game production. The new generation of computer games that is so attractive to so many educators and education policy makers is very expensive to produce in terms of time, development personnel, and funding. Everone seems to want to build the AAA game title in order to excite students about the history of English literature, but who can realistically hire dozens of developers and pay millions of dollars over the course of a year or more to produce that game? How did we get to the point where this is a serious question? This is all a result of the seduction of our senses when it comes to modern video games. Everyone loves the breathtakingly realistic game visuals and film-like quality. And just like a blockbuster motion picture, the soundtrack and voice talent can tremendously enhance the experience. Make no mistake: these are characteristics that draw in game players, and educators see these as the same characteristics that will draw in learners. However, these characteristics aren’t what make games effective for either entertainment or education. When imagination is combined with the power of abstraction, the artifact used to engage players (or learners) is a secondary consideration. That’s why a person is able to get as much enjoyment out of reading The Lord of the Rings trilogy as from seeing the films. Or why the same person can play either Call of Duty or chess and enjoy them both as games of war. The power of abstraction is amazingly effective when it comes to experiential engagement. And it’s that power of abstraction that may allow us to “dial back” on the need for the AAA educational game with the AAA development requirements. As much as I welcome the digital media revolution that is poised to re-engage all of our senses in learning, I would suggest a more technologically humble approach to educational game design that would leverage less resource-hungry production models and recommit to the process of coding and decoding symbolic information: the old-school text adventure game from the genre of Interactive Fiction computer games. What makes Interactive Fiction (IF) so appealing in the context of education are the same things that are problematic in using more multisensory intense simulation-like games. IF games are less difficult, resource intensive, and costly to develop. As a result, they can be customized for specific learning scenarios, and it is conceivable that micro-teams of instructors and storytellers might build IF game scenarios for individual assignments, tightly aligned with course learning objectives. There is existing research that addresses the learning efficacy of IF games (much of it dated from the mid- to late-1980s mainly because that was when IF games peaked in popularity), and the findings are largely positive regarding learner engagement. And because there are so many branching paths, it’s extremely replayable. I’ve gone around the world seven times now, and every journey has felt like a new experience. Every time you complete a circumnavigation, additional stories and events unlock, giving you even more incentive to try again. It’s also brilliantly accessible and easy to play, making it the perfect game to share with someone who never, or rarely, plays them. In other words, this IF game is exactly what we look for in an engaging game experience. What’s interesting to note is that the game was widely praised and recognized for the quality of gameplay. The New Yorker magazine listed it as one of The Best Video Games of 2014. Not only did 80 Days make Time magazine’s Top 10 list, but it it was ranked as the number 1 game for 2014. The fact that 80 Days garnered so many awards and accolades is a strong indicator that the IF genre doesn’t need to take a backseat to AAA titles. I am not advocating an abandonment of the use of AAA games in education. Rather, it’s important that we use development resources wisely, matching gameplay to learning outcomes. It may make complete sense to pair robust multimedia experiences with particular capstone courses, for example, or in classroom settings that ultimately touch a large number of students. And as the cost in time and development declines while the capability of the production technology improves, we’ll no doubt see more opportunities to integrate AAA games into curriculum. In the meantime, graphically-enhanced Interactive Fiction is a tool that can help educators provide engaging and pedagogically relevant gameplay learning experiences to their students in relatively short order at relatively low cost. Are Indie Games an Answer for Curriculum Development? PBS has produced a mini-documentary titled, “The Creativity of Indie Video Games.” This seven-and-a-half minute exploration into the phenomenon of the independently-produced video game raises some interesting questions regarding the potential development of games specifically as education content tied directly to learning outcomes. While the mini-documentary itself does not address the education issue, watching the piece while keeping in mind education needs will trigger some pretty interesting “What if?” ideas. I invite you to have a look and post any thoughts you might have. Before discussing this in the context of education, let’s take a look at how gamification has infiltrated another industry: health and fitness. Virgin’s Healthmiles program is a classic example of gamification in action. Designed to assist employers in promoting healthy lifestyles for their employees, the Healthmiles program exemplifies all of the hallmarks of gamification. Employee progress toward a healthier lifestyle is quantitatively tracked. 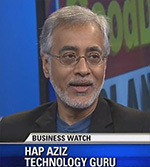 Participants earn badges for various accomplishments, “level up” when they reach certain milestones, and can even compete against coworkers and other program participants through social networking. Successful attainment of goals is also incentivized with HealthCash. Virgin has successfully capitalized on the principles that make gamification effective. 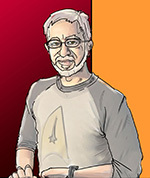 “Gamification… doesn’t rely on internal motivation (emphasis mine). Instead, it’s using the oldest tricks in the book: providing instantaneous feedback, egging on the competition, and rewarding even tiny steps of progress. Gamification assumes that the player isn’t especially motivated — at least at the beginning — and then provides barrels of incentives to ramp up that motivation.” In other words, proper application of external motivation can prime the pump, if you will, of internal motivation and drive success. While this may be true to a point, it is certainly not a panacea—and some will respond more to this type of motivation than others. Let’s apply this logic to the Virgin HealthMiles program. It’s a great notion—after all, who doesn’t want to be healthier? Who doesn’t agree that exercising more and feeling better about themselves is important? And this program rewards and incentivizes what we all know we should be doing! So what rate of participation would you expect in such a program? Seventy-five percent? Fifty percent? According to Virgin, “Our approach…attracts an average of 40% of employees.” Clearly, external motivation cannot drive success in a vacuum! While forty percent of employees taking steps (literally) toward a healthier lifestyle is certainly a good thing, what contributes to the 60%, on average, that do not participate in the program? The answer, in part, is lack of intrinsic motivation. Applied in an academic context, while gamification can certainly be an effective tool to produce desirable results in some measureable contexts, it is no replacement for internal motivation. Students need to understand the value of the tasks that they are performing in order to achieve sustainable learning. A life-long learner is not fostered by extrinsic motivation. When the motivator is removed, the learner must understand the value of learning for its own sake. Gamification certainly can and should play a role in the evolution of education. However, as in all things, it is wise to avoid extremes. Gamification is rooted in incentive theory. Understanding this, before any major shift is made toward gamifying education in any context, it is important to understand other theories of motivation (drive theory, humanistic theory, arousal theory, etc.) to best address the needs of all learners. Tagged as gamification, Gamification in Education: What, gamification.org, GamifyingEducation.org, HealthCash, How, Jessica Hammer, Joey Lee, Martin LaGrow, Virgin Healthmiles, Why Bother? The Game Developers’ Conference (GDC 2012) has reached endgame here in San Francisco, and there are many thousands of weary game developers, producers, artists, designers, investors, educators, and miscellaneous interested parties bugging out and heading home. I’m one of them. What I thought I would do over the next several posts here is take some of the session descriptions and provide some commentary on the relevance and relationship of the topics to the landscape of teaching and learning. I’ve seen many interesting potential connections between the game industry and education during my attendance in years past, and this time around was no exception. In fact, I saw greater engagement and participation from educators during this year’s conference than I have before. That’s quite heartening to those of us who see the potential for gaming techniques and technologies integrated with the mission of education. More to come, so keep watching this space!